Grease 12 muffin tins and preheat oven to 375. 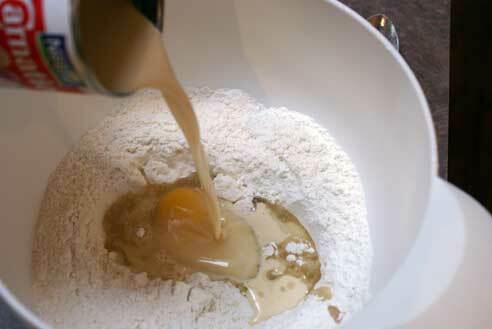 In a large mixing bowl, combine the flour, baking powder, sugar and salt. Add the oil and 2 eggs, then pour in the evaporated milk and 1/4 cup water. Whisk together. Stir in the cooked sausage and shredded cheese. 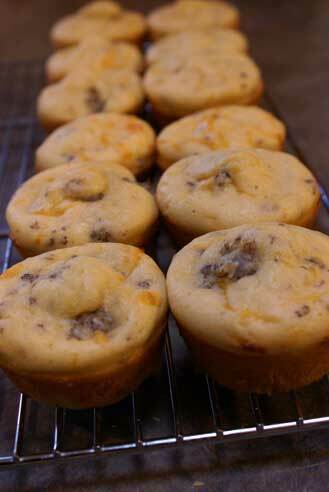 Fill the greased muffin tins 2/3 full with batter. 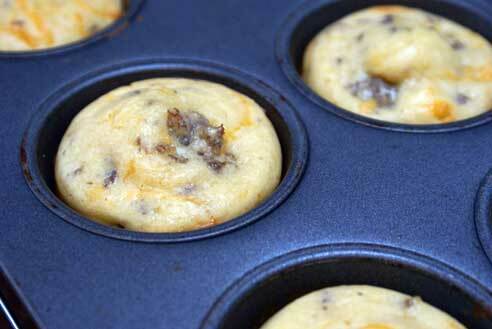 Bake muffins in the preheated oven for 18-20 minutes, or until cooked through. Let cool on cooling rack before serving. Eat up or freeze for another morning! When you freeze something like these, whats the best way to store (ziplock, tupperware etc) and reheat without them getting dry? Jennifer – I freeze in ziploc bags and reheat in those bags (or a smaller one if I’m doing less). Reheating in a microwave safe bag actually creates moisture within the bag so it keeps the muffins from drying out. Hope that helps! I “flash freeze” these. I put them on a cookie sheet in the freezer once they have cooled. I take them out after about 12 minutes and then freeze them all together in a gallon ziploc bag. This way they don’t get stuck together and I can easily pull out what I need. I would like to find a way to make them a tad moister. Maybe add another egg? Looking for then answer to Jennifers question above about freezing ??? Why does it say “the rest of the evaporated milk”? Did I miss another place you add some? It’s inly a 1/2 cup right? I’m trying to use whole wheat more right now than white flour – would these turn out if I went ww instead or should I do a half and half flour mixture? I also wrap bake goods (reheating rolls, muffins, cornbread, buns, ect.) in a damp paper towel when I reheat in the microwave to create steam to keep breads moist. Hope that helps.